Intricate Arkansas blue phantom quartz quantum cluster is miniature in standard mineral sizing only [1-3/4x 2"]. A dark blue phantom and a colorful iris are in a crystal clear pocket between the snowy white veils of a twinned and penetrated Isis faced crystal. Another phantom is in the curved, self-healed based rare shield-faced crystal, which has densely textured, sparkling white veils. 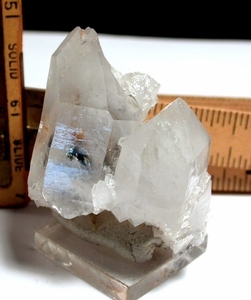 A curve of doubly-terminated crystals 1/2x 1-1/2" long partly surrounds the Isis crystal and end, under a contact in regrowth, in clear tabular points. Quantum clusters are said to be of help when you are planning, seeking, implementing great life changes and need aid to innovate and ride the energy wave. This one, with its' rare blue phantoms can give you a boost on all levels.